Mel Lewis was born Melvin Sokoloff in Buffalo, New York to Russian immigrant parents. His father was a drummer in the Buffalo area who inspired his son to follow in his footsteps from an early age. Still in his mid-teens, young Lewis played with nationally known jazz musicians Harold Austin and Lenny Lewis. Early credits also include stints with Bernie Burns (1946), Boyd Raeburn (1948), Alvino Rey (1948-9), Ray Anthony (1949-50, 1953-54), and Tex Beneke (1950-53). In 1954 he joined Stan Kenton's band, playing alongside such musicians as Jimmy Giuffre, Maynard Ferguson, Laurindo Almeida, Vido Musso, and vocalist June Christy. During his three-year tenure with Kenton, Lewis also worked and recorded with the Frank Rosolino quintet and the Hampton Hawes Trio. In 1957, Lewis settled in Los Angeles where he led a quintet with another ex-Kenton sideman, saxophonist Bill Holman. He worked with the big bands of Gerald Wilson and Terry Gibbs, recording with the latter between 1959-62. The early 1960's saw Lewis in New York with the Gerry Mulligan Concert Jazz Band, in Europe with Dizzy Gillespie, and in Russia with Benny Goodman. Lewis moved to New York in 1963 and formed a big band with trumpeter Thad Jones two years later. 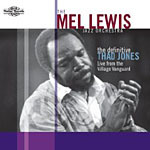 The Thad Jones-Mel Lewis Orchestra performed and recorded extensively, garnering rave reviews and awards. Their performance on the album “Live in Munich” earned them a Grammy Award in 1979. The Thad Jones/Mel Lewis Orchestra, played some of the most progressive big band charts since the swing era. The band had its own unique style, along the lines of big band swing, bebop, and hardbop. The sound was powerful, fast, intellectual, and fun. After twelve productive years, Jones left for Europe and Lewis assumed sole leadership of the band. With the departure of Jones, the Kansas City-born trombonist / pianist / arranger Bob Brookmeyer assisted in the musical direction of the Mel Lewis Jazz Orchestra. Lewis established a residency at the prestigious Village Vanguard in New York City which spanned over two decades. He performed there until one month prior to his death in 1990. Mel Lewis was the recipient of numerous awards, including fourteen Grammy nominations from the National Academy of Recording Arts and Sciences, with one win in '79. Lewis authored a drumming method book It's Time for the Big Band Drummer (Kendor Music Co., 1978) and taught workshops on jazz drumming at William Patterson State College in New Jersey. All About Jazz musician pages are maintained by musicians, publicists and trusted members like you. Interested? Tell us why you would like to improve the Mel Lewis musician page.